Here’s to the grace of a cat walking through the room and the comedy of kittens in monster drills. Joseph Wambaugh, 1937, writer known for his fictional and non-fictional accounts of police work in the U.S.
Write a list of questions a cat might have. Have a dialog on paper with a cat. Write a poem, haiku, laundry-list, or song to celebrate life. Make a collage that is a celebration of life. Celebrate life with a cat – share some salmon. What a wonderful life I’ve had. I only wished I’d realized it sooner. 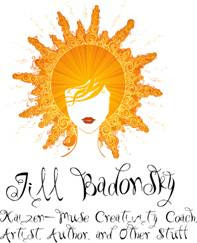 This material is (c) Jill Badonsky and may not be duplicated without the express consent of the author/artist.